If you have ever gone out of your way to do a good deed for another, you know the amazing feeling that follows. Doing something nice for someone else is a scientifically proven, positive way to enjoy a rush of feel good emotions and all the benefits that accompany them. It lowers stress levels, helps keep mental health strong, and can even extend life expectancy! Of course, seeking out opportunities to help others is often easier said than done, particularly when you take busy work and family schedules and responsibilities into account. Fortunately, there is always at least one good deed that nearly anyone can do at nearly any time that suits their schedule – blood donation. Most people envision their blood going to a single individual of the same blood type. But, in reality, one donation could save up to three lives! There are times when patients need a transfusion of whole blood, but there are others where only certain components of blood are needed. 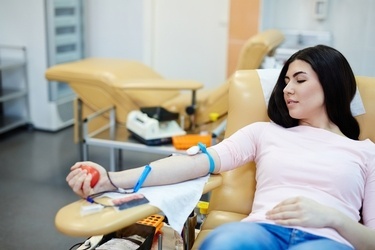 For this reason, blood banks are able to extend the usefulness of each donation by separating them into red cells, platelets, and plasma, each of which could potentially go to a different patient. Before giving blood, each donor must undergo a minor health check that includes pulse, blood pressure, body temperature, and iron levels. But, it doesn’t end there. After your blood has been collected, it is sent to a lab where further testing is conducted. In total, your blood will be checked for 13 infectious diseases such as West Nile and HIV, and should any of these tests return a positive result, you will be notified immediately. Not only does donating blood help save lives, help monitor your health, and make you feel good, it could also offer some long-term benefits to your physical health. The process has been shown capable of helping improve blood flow in some, resulting in healthier blood vessels and a lower likelihood of arterial blockages. Likewise, the regulation and balance of iron levels that comes from blood donation is another perk leading to stronger blood vessels. Perhaps this is why research has indicated that blood donors are 88 percent less likely than others to suffer a heart attack! When it comes to good deeds, there are few that have as many benefits for as many people as the simple act of blood donation. If you are looking for a way to give back to your community and to help improve the lives of others (and yourself), this is a perfect solution. On January 19, 2018, Lane Regional Medical Center will be hosting a blood drive as part of National Blood Donor Month. Not only will you be doing a great deed during a time of year that it is sorely needed, but you’ll also have the opportunity to win some special prizes. Simply click here to learn more about the event, set your appointment time, and help us save lives!